It’s not just jobs, either — many people now want to live in urban places. It turns out that the suburbs with their traffic, limited access, and manufactured sameness aren’t always so great. People don’t want to have to drive everywhere. They want to be able to walk or take the train to work, and walk to a diversity of stores and restaurants. They want lively streets and public spaces. In order to get there, we need complete neighbourhoods — areas that have different land uses in walking distance of each other. The model is for dense, complete communities along a high-capacity transportation spine, and for buses along cross-corridors to connect lower-density areas with the spine. This is good for the environment, for taxpayers, and for quality of life. People can walk for many of their trips, using less infrastructure and contributing to better health. With people travelling in a multitude of patterns, trains don’t run empty in any direction — especially when downtowns or malls anchor the ends of the line. They have enough demand to run frequently throughout the day and evening, allowing commuters to feel confident leaving their cars at home. Instead of new growth taking place as further sprawl or as haphazard development throughout the region, planning policy guides it to occur along major transit corridors. The growth takes place where it produces mostly transit riders on a high-capacity train instead of producing more traffic on congested roads, and where it uses existing utilities. Instead of draining the city’s resources on sprawling infrastructure, such growth benefits the city through increased liveliness and economic productivity. I am proud that Waterloo Region is looking to the future and planning a more sustainable urban form. The Region’s new official plan, new transportation master plan, and the proposed light rail system are the key steps by which we will escape the cul-de-sac of the hollowed-out suburban ideal. Addendum: This isn’t my last column after all. Turns out I get another column in December! It’s often forgot that people “flew” away from cities on streetcars because cities were incredibly hostile, polluted, noisy places at the time. Electric and gas heating, pollution control technology and legislation, as well as greater emphasis on building nicer cities has, for the most part, reversed the equation. Good to see another great article Michael! Great post. 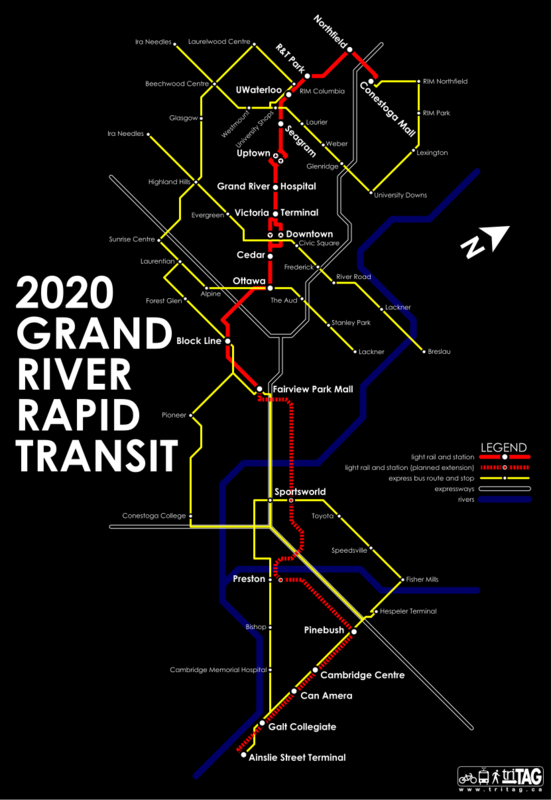 I like the idea of a regional rail system, I just don’t think there will be a return on investment and I don’t think it will be used unless our taxes go up dramatically. The TTC Subway system is a money losing system but it transports a tonne of people everyday, there’s no way Waterloo Region would ever see that kind of usage, it’ll be a money pit. It would be nice to to have Waterloo monorail but I think there are more important issues to tackle first. The addage of build it and they will come, is like giving away your credit card number. * Make the city more pedestrian and bicycle friendly. (We’re making great progress but with 800 million we could do way better). * Implement the LRT by improving the bus system. I’ve heard the argument that trains will be more attractive and increase ridership whereas people in this city equate buses with lower class. Spend money to change this perception. Spend money so it’s actually convenient to use the bus system rather than hop in your car. * Actually clear pedestrian and bicycle pathways from snow in a just as timely a fashion as the car lanes. * Build an intra regional transport system. Haul the commuters up and down the 401 before doing it along king street. * Build a rail system so that Waterloo Region folks can get to the Toronto Airport. It’s insane that this still hasn’t happened. Again love reading a well thoughtout argument, thanks for sharing! *Starting next year, the Region is indeed spending quite a bit of money on totally redesigning and seriously improving the bus system so that it makes for a solid network together with LRT. *Commuters to the GTA and travelers to the airport are important markets, but they make up a tiny fraction of commutes in the Region. The vast majority of trips and commutes stay within the Region. (Intercity rail also requires substantially more investment per rider.) Also, the GO extension is ready to go ahead, except that it’s held up by a dispute with the owner of the rail line. GO is also working on an airport connection. *There is no zero-cost option. The context for this is substantial growth, and transportation infrastructure needs to be built to handle it. It’s a matter of which infrastructure is better for the long-term, and where the future growth will be directed. *Pedestrian and cycling infrastructure is a good complement to a serious transit system, but we also need transit that can compete with the car for the longer trips people make here. It’s less of a stretch for most people to take the bus or train than it is for them to cycle 5-10 km to work or the store year-round on even the infrastructure we could get built within the observable future. To have high-capacity Bus Rapid Transit, you have to build a bus highway and cut off cross streets. That’s not feasible here (nor anywhere near cheap), and the sort of BRT that we could fit through our urban centres is not sufficient capacity-wise for the medium term.